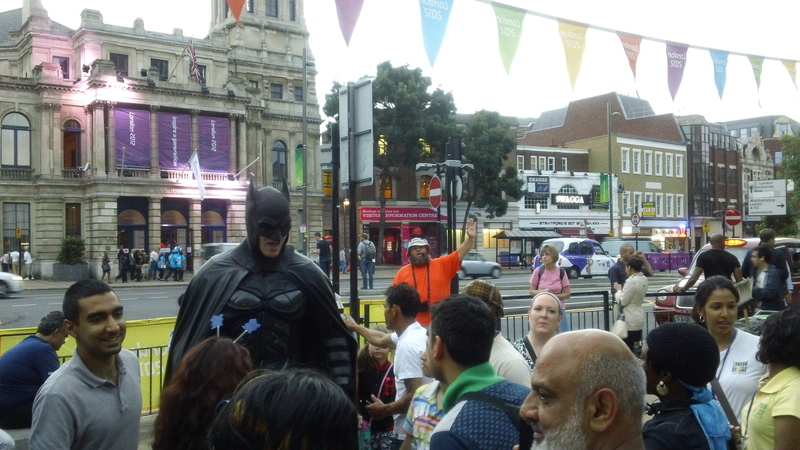 Bobby McCreery preaching outside of the Stratford Center with Batman drawing a crowd. What a day! We arrived in London safely on Friday morning around 7:30am and into Guildford where we are residing at 9:30am. After getting settled in, I managed to get about an hour’s sleep, which is all most of the team was able to get over night through the flight. Unfortunately, we were unable to meet up with the saints at GraceLife London as planned due to the rest of the team’s late arrival, but I am still planning on attending worship on Sunday. 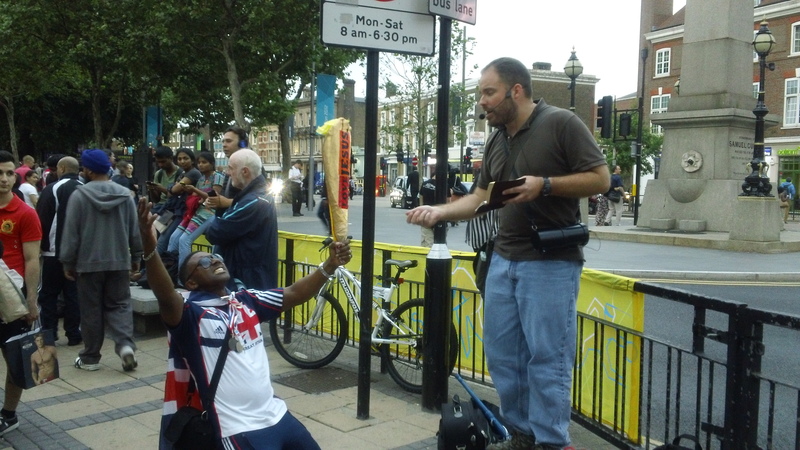 The Lord provided us with the strength we needed to carry out our mission to Olympic Park Friday evening. 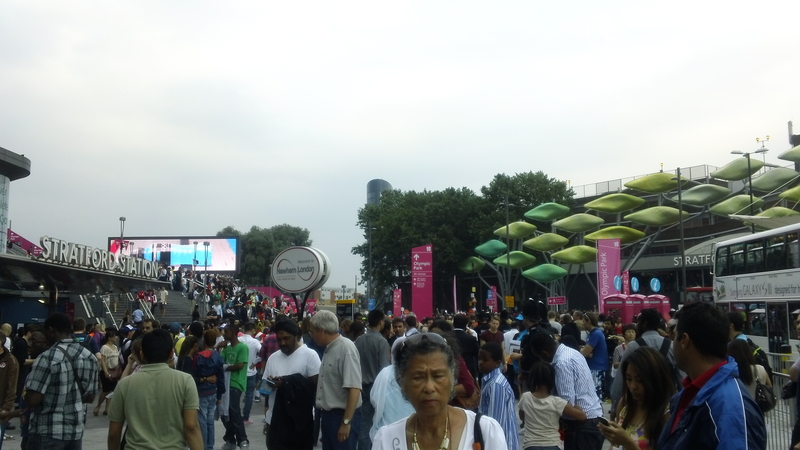 It was amazing to see droves of people from all around the world gathered in one small place. I’ve never seen so many religious cults evangelizing with their literature and even open-air preaching. The spirit of antichrist is alive and well here! Nevertheless, the Gospel of Jesus Christ went out in power! I was teamed up with Greg, Dorothy, and Bobby, and we managed to set up on the other side of the Stratford mall, which is right outside of Olympic Park. The advantage here was that we were not restricted with our use of amplification as the other teams since they were so close to the Park. For nearly three hours, we open-air preached, handed out tracts, and engaged people in one-to-one conversations. 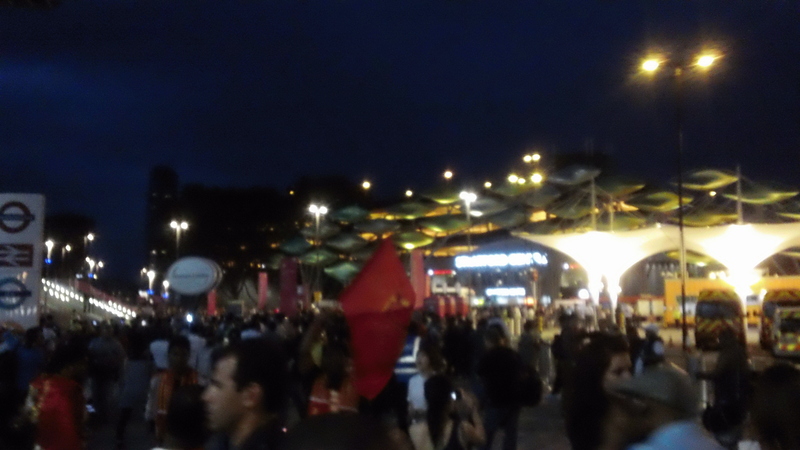 We were about 50 yards outside the mall entrance, and floods of people were around the entire time. I’ve never experienced this type of preaching environment where so many people stopped to listen to the preaching. 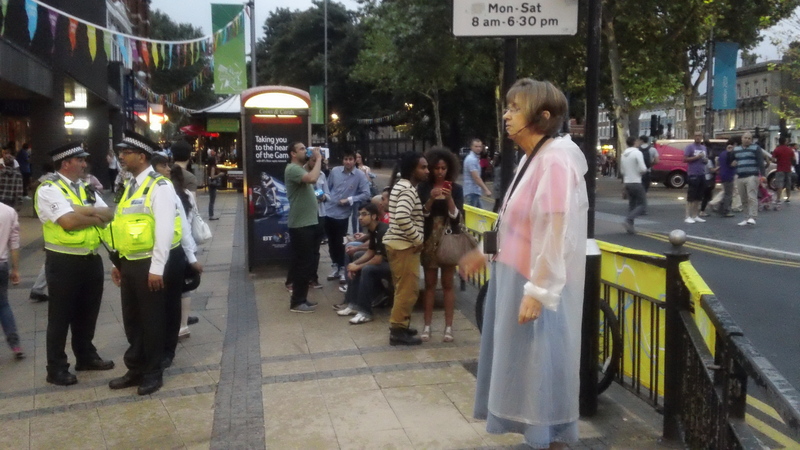 People were out enjoying themselves seemingly with no where particular to go, so they had time to stop and listen. This prompted several great witnessing encounters with a Muslim Somali, a Scot, some Egyptians, and many others. We were encouraged by several saints, and a small group even joined us for a while with one of the British brothers preaching on his megaphone. There was so much more, but I have to run to get some breakfast before our morning devotion. It was an incredible first night and I praise God for giving us everything we needed especially with basically no sleep from the night before. We’re all now well rested and will head into downtown London today. Please continue to pray for us and the thousands of people who will be hearing the Gospel preached. I’ve been told 13 million people are flocking to London for the Olympics! ← Mission to Olympics Is Here! What a great testimony. Thank you for taking the time to report. Continued prayers for you and the saints. Great to hear guys. Praying for the Spirit’s power to come upon you and for your health, safety, strength and stamina. What an opportunity, Justin! So excited for you all to be there for this world wide event and to share the Gospel to literally-the world. Prayers will be lifted up for you all and your safety. Thanks for keeping us posted! Good job I will keep praying for you Brother. May the Lord continue to bless you and the team on this the olympian mission, brother. I know He will. Know you are prayed for here in Canada. Keep up the good work and keep the updates coming…IF you can. Very encouraging stories, vids and pics coming from there. Thank you so much, saints – the Lord is answering your prayers!